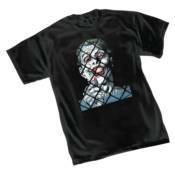 The clown Prince of Crime enjoys his momentary incarceration on the new Joker: Fenced T-Shirt. Features the art of Jim Lee screenprinted in full-color on a black, 100% cotton shirt. One can only image what shade of lipstick he's wearing today? NOW AVAILABLE for sale in Canada and U.K.